Interest in the influences of food on the capacity for physical activity is as old as mankind. From earliest times, certain foods were regarded as essential preparation for strenuous physical activity. In a recent consensus conference on food, nutrition and sports performance, carbohydrate containing foods were identified as having the most significant impact on exercise performance. The nutritional importance of protein, as a fuel for exercise and as a contributor to strength development, has been over emphasized, whereas the fluid intake has been, by comparison, underplayed (183). Most studies on the influence of carbohydrate intake on exercise performance have been conducted in laboratories using either cycling or treadmill running. Performance is usually assessed as either the time to exhaustion (endurance capacity) during exercise of constant intensity, or the time to run a predetermined distance or complete a prescribed workload (performance) in the shortest time possible. In some studies, the investigators have combined the elements of both endurance capacity and performance in one protocol in order to try to simulate an activity pattern common in sports. For example, running at a constant submaximal pace for an hour or more and then completing a set distance in as fast a time as possible; or cycling at a constant submaximal workload and after an hour pedaling as fast as possible to complete a set work load as quickly as possible. The division between endurance capacity and endurance performance is artificial because in any real life endurance race or event, both endurance capacity and pace are required in order to be successful. Nevertheless, by obtaining a better understanding of simple endurance capacity, we can get a clearer picture of the essential determinants of endurance performance. Health professionals argue that a healthy diet is one which provides us with at least 50% of our daily energy intake in the form of carbohydrates, 35 % or less from fats and the remainder from proteins. The common message is that we should move from high fat meat-based diets to those that are made up of more carbohydrates and fresh fruits and vegetables. The consensus view on the diet for athletes and active people is that it should include more carbohydrate-containing foods than recommended by the health professionals. Their diets should be such that about 60% of their daily energy intake is obtained from carbohydrates, 30 % or less from fat and 10 to 15 % from proteins (183). An early study exploring the link between diet and exercise capacity found that after a period on a high carbohydrate diet, endurance capacity on a cycle ergometer, doubled in comparison with the exercise times achieved after consuming a normal mixed diet. In contrast, a fat and protein diet reduced exercise capacity to almost half that achieved after normal mixed diets. This clearly showed the benefits of eating a high-carbohydrate diet before prolonged exercise and was the first to establish importance of the carbohydrate content in the diets of athletes preparing for competition. The benefits of carbohydrate loading before prolonged submaximal exercise have been shown mainly during cycling. A link was demonstrated between endurance performance during cycle ergometry and pre-exercise muscle glycogen concentration (184). The importance of muscle glycogen during prolonged exercise was confirmed in subsequent studies which showed that fatigue occurs when muscle glycogen concentrations are reduced to low values (185-187). Therefore, it is not surprising that attempts were made to find methods of increasing muscle glycogen stores in preparation for prolonged exercise. 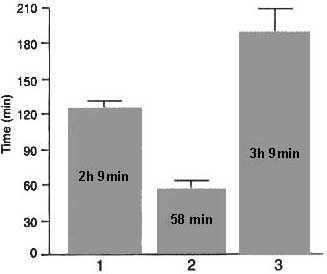 One study (188) examined the influence of different nutritional states on the resynthesis of glycogen during recovery from prolonged exhaustive exercise. 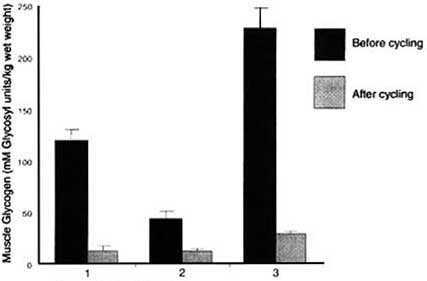 It found that a diet low in carbohydrate, and high in fat and protein for 2 to 3 days after prolonged submaximal exercise, produced a delayed muscle glycogen resynthesis, but when this was followed by a high carbohydrate diet for the same period of time, glycogen supercompensation occurred (see Figure 7). This dietary manipulation not only increased the pre-exercise muscle glycogen concentration but also resulted in a significant improvement in endurance capacity (see Figure 8). Although this original method of carbohydrate-loading was recommended as part of the preparation for endurance competitions, the low carbohydrate, high fat and protein phase of the diet is an unpleasant experience. Therefore, alternative ways were explored to increase the pre-exercise glycogen stores without including a period on a diet high in fat and protein (189). It was found that a carbohydrate-rich diet consumed for 3 days prior to competition, accompanied by a decrease in training intensity, resulted in increased muscle glycogen concentrations of the same magnitude as those achieved with the traditional carbohydrate loading procedure. There have been fewer studies on the influence of carbohydrate loading and endurance capacity during running. In one of the few running studies, the question of what type of carbohydrate should be consumed in preparation for prolonged exercise was considered (190). The runners' normal mixed diets were modified by providing either additional protein, complex carbohydrates or simple carbohydrates. The 'complex' carbohydrate group supplemented their normal mixed diet with bread, potatoes, rice or pasta. The 'simple' carbohydrate group ate their normal mixed diet but increased their carbohydrate intake with chocolates. Running times increased after both high carbohydrate diets. The complex carbohydrate group improved their running times by 26%, and the simple carbohydrate group improved by 23%. There was no improvement in the performance times of the protein group, confirming that the carbohydrate content of the diet is the important nutrient and that the changes were not simply the consequence of a greater energy intake. In a recent study, the influence of carbohydrate loading on running performance during a simulated 30-km race was conducted using a laboratory treadmill (191). One of the aims of this study was to determine at what point during the race runners began to show signs of fatigue and how this was modified by dietary manipulation. The treadmill was instrumented so that the subjects controlled their own speeds using a light-weight hand-held switch. Changes in speed, time, and distance elapsed were all displayed on a computer screen in full view of the subjects. The runners were divided into two groups after the first 30-km treadmill time trial. One group increased their carbohydrate intake during the 7 day recovery period, whereas the other group ate additional protein and fat in order to match the increased energy intakes of the carbohydrate group. Although there was no overall improvement in performance times for the two groups, the carbohydrate group ran faster during the last 10 km of the simulated race. Furthermore, eight of the nine runners in the carbohydrate group had faster times for 30 km than during their first attempt, and better times than the control group. Even though the carbohydrate group ran faster than the control group, after carbohydrate loading they had lower adrenaline concentrations. This was attributed to the carbohydrate loading and subsequent maintenance of normal blood glucose concentrations throughout the race. Noradrenaline concentrations increased, as expected, during the simulated 30-km races following normal dietary conditions and after carbohydrate loading. More people participate, at a recreational level, in 'multiple-sprint' sports (such as soccer, hockey, tennis, basketball and rugby), than endurance (cycling, swimming or running). These multiple-sprint sports involve a mixture of brief periods of exercise of maximum intensity followed by recovery periods of rest or light activity, and last up to 90 minutes. Only a limited amount of information is available, however, on the influence of diet on exercise of maximal intensity and brief duration. One of the reasons for the limited amount of research on this topic has been the lack of suitable laboratory methods for studying the metabolic and physiological responses to maximal exercise. Inexpensive micro-computers are now widely available, and so they are used to record rapid changes in power outputs during maximal exercise of short duration. Even though there is rapid utilization of muscle glycogen during several brief periods of maximal exercise, the rate of glycogenolysis decreases as exercise continues. For example, in a series of 10 maximal sprints of 6-second duration and 30-second recovery on a cycle ergometer, glycogen degradation was reduced by half during the last sprint (192). This glycogen sparing is probably the consequence of an increase in the aerobic metabolism of glycogen and free fatty acids (193). Performance during sports which involve several brief sprints may not be improved by carbohydrate loading. Sports which demand that their participants perform a combination of submaximal running and brief periods of sprinting, such as soccer, reduces muscle glycogen concentrations to critically low values. Performance is impaired when this occurs, and so carbohydrate loading would probably be of benefit to participants in multiple-sprint sports (194). The type of the carbohydrate in pre-exercise meals and their influences on subsequent endurance capacity has, until recently, received too little attention. The description of carbohydrates as either simple or complex is an inadequate way of classifying them. A metabolically more informative way of describing carbohydrates is the degree to which they raise blood glucose concentrations. Carbohydrates which produce a large increase in blood glucose concentration, in response to a standard amount of carbohydrate (50g), are classified as having a high glycemic index. The metabolic response during exercise is different as a consequence of the glycemic indices of the carbohydrates consumed preceding the exercise (195), and so the choice of carbohydrate in pre-competition meals could have an effect on performance. In one study on the influence of high and low glycemic index carbohydrate foods on exercise capacity, the low glycemic index carbohydrate appeared to improve endurance capacity to a greater extent than the high glycemic index food (196). This study used lentils as the low glycemic index food, with potatoes and glucose as the high glycemic index foods, and compared the responses to these after drinking a glucose solution or plain water. Eating a high fat meal three to four hours before exercise is not recommended as a nutritional preparation for endurance competitions because these meals take a longer time to digest. There is some evidence from animal studies to suggest that increased fat intake will result in a lower than normal oxidation of carbohydrate during exercise. If this glycogen sparing did occur following a high fat meal then it would be expected to delay the onset of fatigue in a similar manner to consuming carbohydrate-rich meals before exercise. A recent study has attempted to answer this question by comparing the endurance performances of subjects following isocaloric high fat or high carbohydrate meals, four hours before submaximal exercise (197). The pre-exercise meals contained approximately 280g of carbohydrate in the high carbohydrate meal and 84g in the high fat meal. There was no statistically significant difference between the endurance times from the high carbohydrate and high fat (low carbohydrate) meals (197). Recovery from exercise is not a passive process. Tissues undergo repair and reproduction, fluid balance is restored and substrate stores are replaced. Carbohydrate replacement is one of the most important events during recovery. When several days separate periods of exercise or participation in sport, a normal mixed diet containing about 4 to 5 g/kg body weight (BW) of carbohydrate is sufficient to replace muscle glycogen stores. However, daily training or competition makes considerable demands on the body's carbohydrate stores. Therefore, the normally high carbohydrate intake of athletes may not be enough to prevent a gradual reduction in this important fuel store. For example, even when the daily carbohydrate intake is 5 g/kg BW, cycling or running for an hour each day gradually delays the daily restoration of muscle glycogen stores (198). Increasing the carbohydrate intake to 8 g/kg BW per day may not be enough to prevent a significant reduction in muscle glycogen concentrations after 5 successive days of hard training (199). These studies underline the importance of prescribing adequate amounts of carbohydrate for athletes in training and justifies the need for more frequent recovery days between periods of intense training. The clear message from over a half a century of research on the links between food, nutrition and exercise capacity is that next to natural talent and appropriate training, a high carbohydrate diet and adequate fluid intake to avoid dehydration are the two most important elements in the formula for successful participation in sport. Of course, there is an underlying assumption that athletes normally eat a well-balanced diet made up of a wide variety of foods, and contains sufficient energy to cover their needs.